The system after the prolongation of tram lines 6 and 16 to VU Medisch Centrum and of line 7 to Sloterpark, the creation of a branch to De Aker on line 1, the elimination of circle line 20 and the prolongation of light rail route 51 to Westwijk. 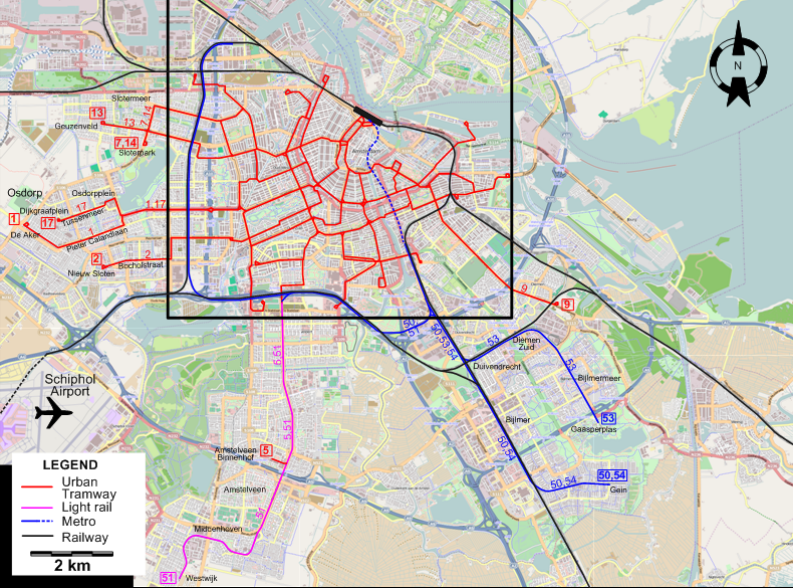 I created the above maps by overlaying OpenStreetMap (OSM) maps with my own data. Copyright on the OSM maps is © OpenStreetMap contributors, licensed under a CC-BY-SA (Creative Commons Attribution-ShareAlike 2.0 licence). Please note that the OSM maps used as a template for these maps corresponds to the situation at the time the map was downloaded and may show features that did not exist at the time the GS Tram Site is supposed to show. In particular, it may show bridges and highways that were built later. 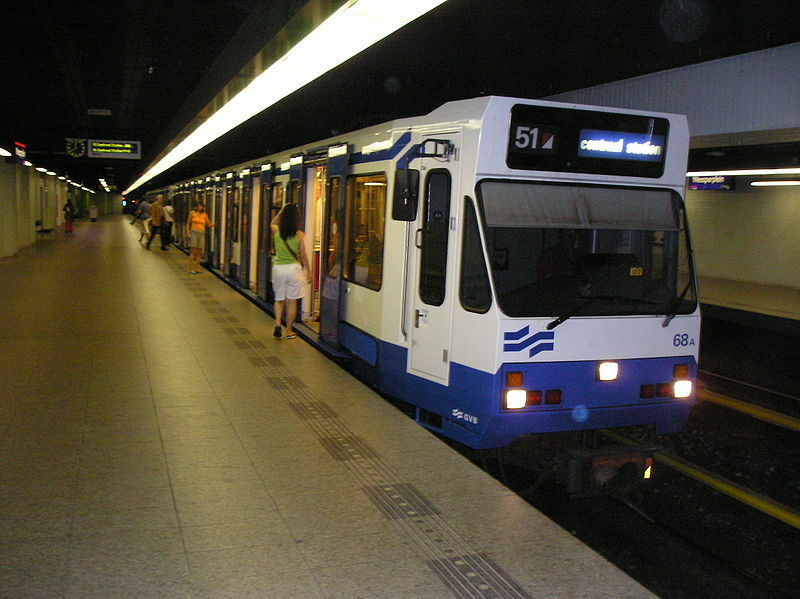 NB: Between Station Zuid WTC and Westwijk, Metro line 51 runs like an LRT line. Tram No.5 also runs over about half this track, between Station Zuid WTC and Amstelveen. Urban trams: (horse-drawn) 3 June 1875 - 6 Aug. 1916; (electric) 14 Aug. 1900 - today. LRT: 1 Dec. 1990 - today. Metro: 16 Oct. 1977 - today. Amsterdam - Het Schouw - Monnickendam - Purmerend: 22 June 1894 - 22 June 1932 (steam), 23 June 1932 - 14 May 1949 (electric). Amsterdam - Haarlem - Zandvoort: 6 Oct. 1904 - 31 Aug. 1957. Amsterdam Weesperpoort - Diemen - Muiden - Muiderberg - Naarden - Laren (GoTM): 22 July 1881 - 15 Jan. 1932 (steam), 16 Jan. 1932 - 12 Feb. 1940 (Murderberg - Laren ceased to operate on 14 Oct. 1939) (petrol engines). Interurban trams (NZH): 1000 mm. Interurban trams (GoTM): 1435 mm. The Electrische Museumtramlijn Amsterdam, started in 1975, runs old trams (from Amsterdam and elsewhere) along a 7-km track starting at Haarlemmermeerstation. Koenot, L. Tram 2000 - Flash 1998. Bruxelles: Tram 2000, 1998. Moerland, M. "Amsterdam - Amstelveen Line sets the pattern for the future". In: Light Rail Review 3. London: Light Rail Transit Association, 2001 [p.19-24]. 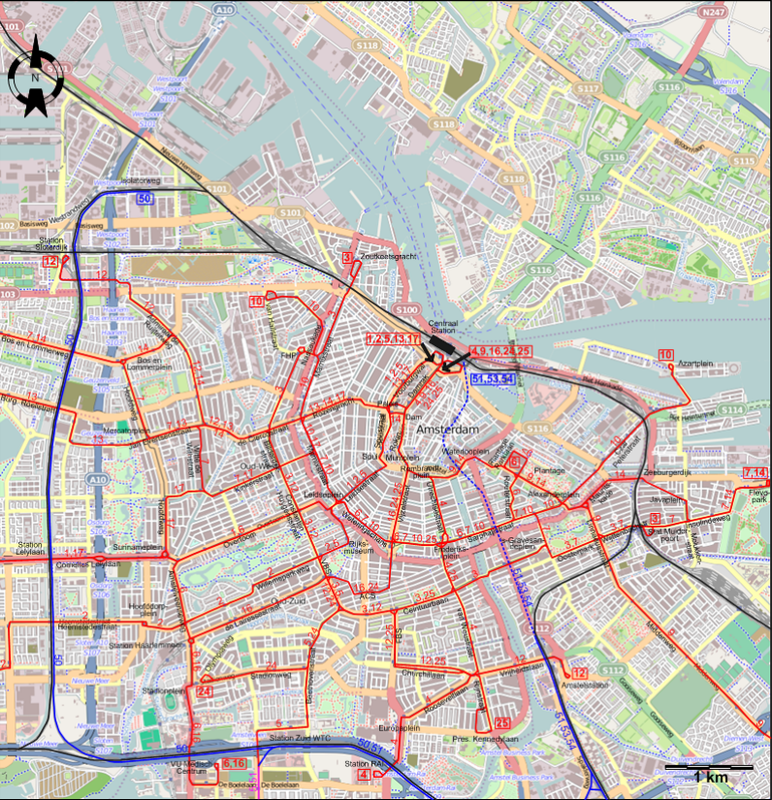 Pulling, N. "Amsterdam - the rough and the smooth", Tramways & Urban Transit, Dec. 2009 (72: 864), p.470-472. 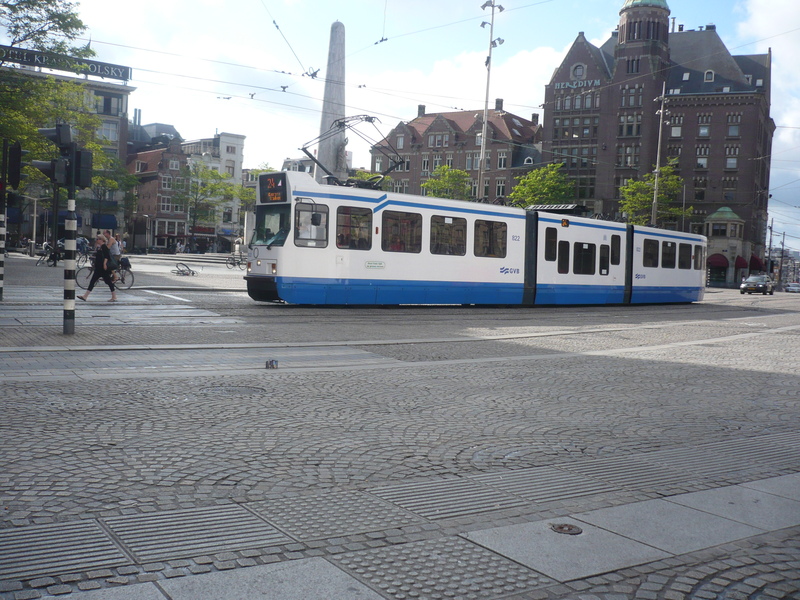 Pulling, N. "Systems Factfile No.44: Amsterdam, the Netherlands", Tramways & Urban Transit, May 2011 (74: 881), p.179-182. Van Dam, F. "Amsterdam meets the energy crisis", Modern Tramway, Feb. 1974 (37:434), p.57-60. Van Mechelen, C. Trams en tramlijnen: 70 jaar elektrische tram in Amsterdam - 1900-1970. Rotterdam: Uitgevers Wyt, 1970. Vernieuwen en veranderen - Vervoer en vervoerbedrijf van Amsterdam in de periode 1945-1980. Amsterdam: Gemeentevervoerbedrijf 1982. Vreedenberg, H.A. "Enemy occupation and tramways in the Netherlands", The Modern Tramway, Apr. 1946 (9: 97), p.29-31, 36, 38. Wansbeek, C.J. 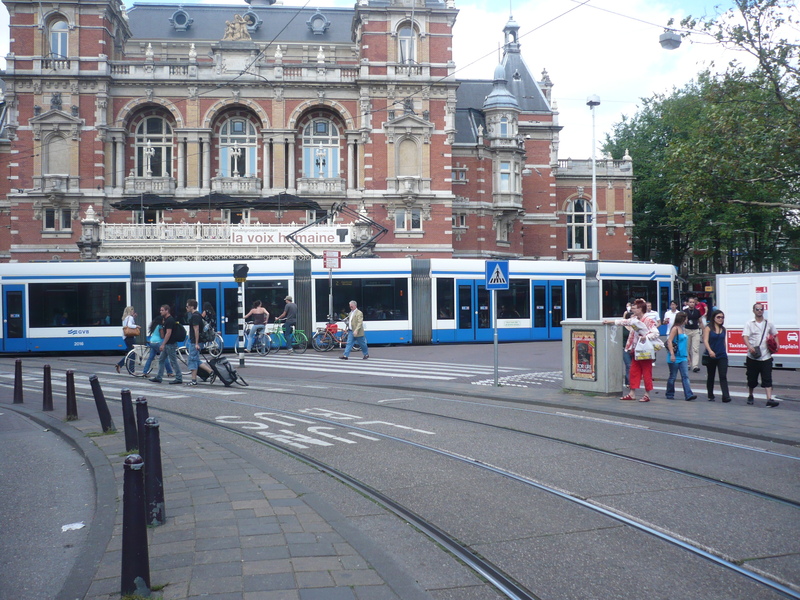 "Amsterdam metro grows - but trams still hold sway", Tramways & Urban Transit, June 2008 (71: 846), p.219-222. Wansbeek, C.J. "Blue Tram: Top notch LRT shouldn't have been axed", Tramways & Urban Transit, March 2008 (71: 843), p.100-1042. Wansbeek, C.J. & Fox, P. "Amsterdam - A tottering giant". In: Light Rail Review 8. London: Light Rail Transit Association, 1996 [p.4-16]. Thanks to Prof. Maurits van Witsen from the Netherlands (and of the web site lightrail.nl) for the large amount of historical information on the Amsterdam system he furnished me through personal communication. Thanks to Peter Zondag (from Utrecht, The Netherlands) for information obtained through personal communication.